I was delighted to see that in the latest edition of Love Sewing magazine, issue 37, the free pattern was this McCalls M7381. I love floaty dresses and this looked like it was right up my street. The size range in this single pattern is quite impressive too. It covers sizes XS through to XXL. Pretty good (until you get to the part when you want to fold the pattern pieces back up and try to get them back in the envelope! Ha! Several versions of the dress are available to choose from. Long sleeves, short sleeves, sleeveless and maxi length. I chose view C.
My fabric choice was from Minerva crafts found here. Its a beautiful viscose challis and the print is adorable. I must admit that I love the Minerva web site, most often as well as a good description of the fabric there is a video which shows you how the fabric drapes, creases, stretches and how sheer it is. Super helpful. The most difficult part of making up any pattern is deciding what size to cut. I must admit that very often now I will cut a toile, not great when you want to quickly get on with a new pattern but quite often necessary. I should have done so in this case and I didn’t. Off I jolly well went and after pre-washing the fabric (now this really is essential and I never skip doing this)! I chose to cut the pattern in a size large which is what my body measurements showed as on size chart on the envelope. I was nervous as this would normally by accompanied by a ‘finished measurement’ size chart which I would refer to but couldn’t see this. The dress is fairly straightforward to make up. The bodice was the most complicated part because it is lined, so requires several pattern pieces. This was a nice challenge for me as I have made several very easy patterns of late and it was good to sew up something a little more challenging (but still not too difficult). After the bodice is made up the rest of the pattern comes together quickly. Some pretty features of this pattern are the pleat details at the shoulders and skirt front. I also like the faux tie belt feature at the front waist. It is comfortable to put on and wear, and has an elasticated waist at the back of the skirt. Snap studs or poppers are hand sewn in on the bodice front, although I moved the placement of mine to show less cleavage! As you can probably see from the photos the dress has come up much too large. I could have easily have gone down at least one size band. The bodice has far too much room in it and the elasticated gathers at the back just seem to accentuate this unfortunately. Boo. If i had not been in so much of a rush to cut it out and make it I probably would have read a couple of really good reviews by Amy and Rachel where both mention the size aspect of this pattern. 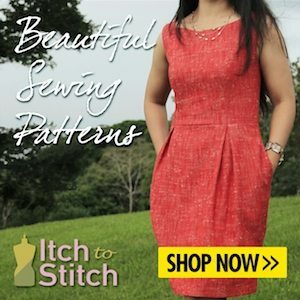 Do head over to these lovely ladies blog posts if you are considering making this dress, I’m sure that you will find it useful. I really enjoyed making the bodice lining for this dress. I feel it gives the dress much more of a finished look and looks so much better than seeing the seams on the inside. I also remembered to pop in one of my name labels – I often forget to do this when I get engrossed in my sewing! Don’t let my sizing problem put you off making this lovely pattern. At the time of releasing this post I believe that issue 37 of Love Sewing may still be current- just. (next issue out March 23rd) so if you’re interested in a free copy of this pattern you may still be able to track down an issue before issue 38 comes out later in the week! I think this dress can be rescued with some little adjustments here and there from me. It would be a shame not to enjoy it this Summer as I do love so love the fabric. Have you made this dress, what did you think?